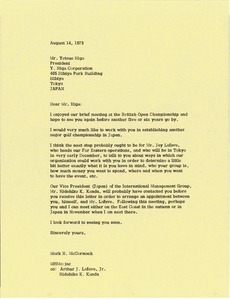 Japan - McCormack would like to work with Higa in establishing another major golf championship in Japan. Japan - McCormack feels that the solution reached concerning VIP Day in Japan is excellent and solves problems on all sides. 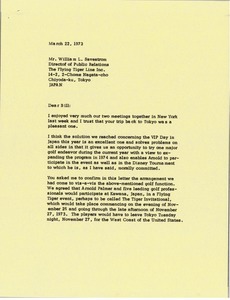 McCormack confirms that Arnold Palmer and five leading professionals will participate at Kawana, Japan in a Flying Tiger Event, perhaps to be called the Tiger Invitational. 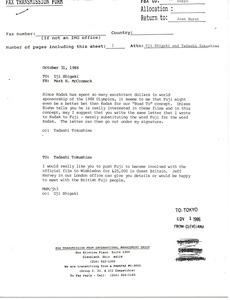 Japan - Instructing Matsuki to continue to ship samples to Bonallack. Informs Uji that the World Cup Golf event has been cancelled because of the Dunhill Cup. 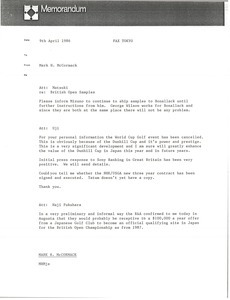 McCormack informs Fukuhara that Augusta would be receptive to an offer from a Japanese Golf Club to become an official qualifying site in Japan for the British Open Championship in 1987. 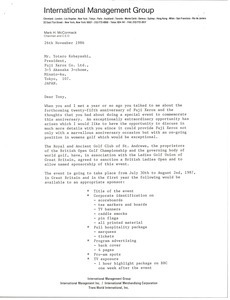 Japan - McCormack discussing the twenty-fifth anniversary of Fuji Xerox and suggests special golf events to commemorate the anniversary. 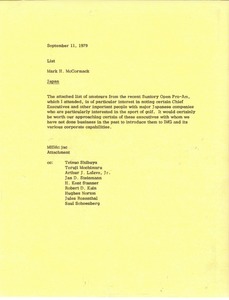 Japan - Concerning a possible golf outing in Japan. 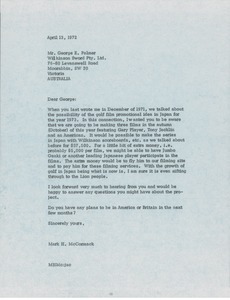 McCormack notes the possibility of Arnold Palmer and other golfers being in Japan in October and indicates he may have confirmation in the coming months. 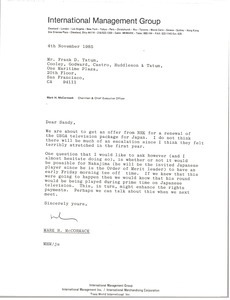 Japan - McCormack notes that they are about to get an offer from NHK for a renewal of the USGA television package for Japan. 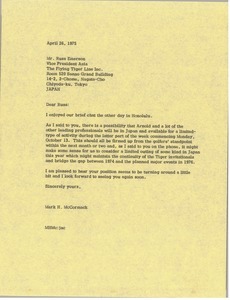 Japan - McCormack woudl like to further discuss the possibility of the golf film promotional idea in Japan. Japan - Thanking Ohnishi for recent meetings in Japan and updating him on several projects. McCormack promises more information following a golf meetign in Cleveland, comments on discussions with John Read of Rolex regarding working on a tournament, and indicates that he will be thinking about a mixed golf event idea. Japan - McCormack believes the attached list of amateurs from the Suntory Pro-Am would be of interest due to certain Chief Executives with major Japanese companies who are interested in golf. 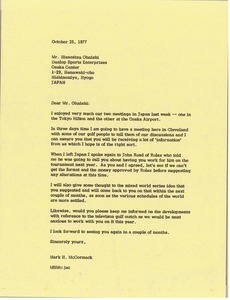 Japan - McCormack suggest contacting Fuji for their "Road To" concept. Discusses Japanese golf..